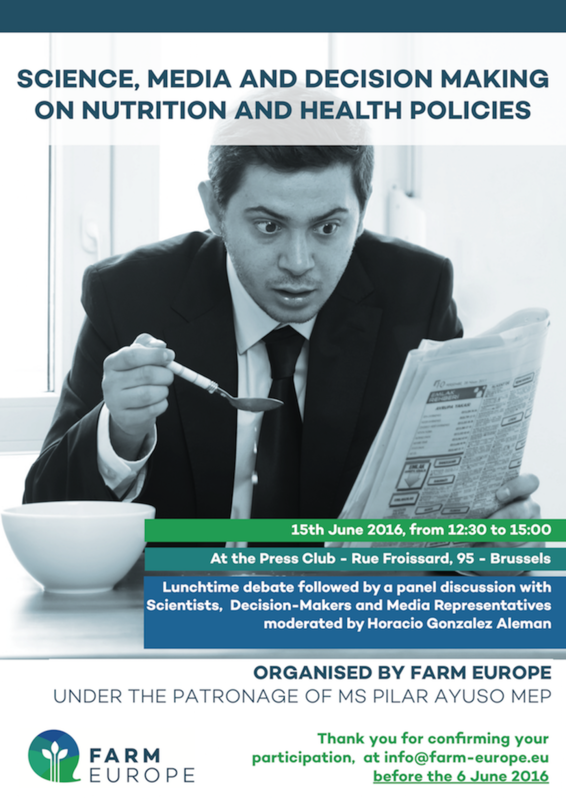 On June 15 , Farm Europe organized a Seminar on Science, Media and Decision Making on Food and Nutrition with the aim of launching the debate on the topic and trying to propose ideas on how to improve the relation and interaction among science, media and decision makers. The strong interest and participation to a very lively discussion between speakers and audience showed the necessity of having such a debate. The issue is quite complex, intriguing and critical. We had the chance to tackle the debate from different perspectives: speakers and attendees included politicians, scientists, media, regulators, industry representatives, consumers. The EU uses science to support decision-making across a wide range of policy areas. Scientific evidence can be used to help identify potential risks, protect citizens and use resources more wisely, as decisions and actions are taken. However, we are far from an ideal world: the relationship between science and decision-making is not easy, and not always straight-forward. Decisions are not always based on science and science does not always provide clear answers. One area where this is the case is nutrition policy. How can we improve the exchanges between science and policy-making, when aiming to improve diets and people’s health? Is scientific evidence properly considered in nutrition policy and measures taken to improve people’s diets? Do we need more scientific evidence for a more effective nutrition policy? “If you take obesity, there is no one-fits-all recipe” (Prof. Agostoni). Everybody agrees that policy decisions should be based on sound scientific basis. Nevertheless, “the lack of harmonized methodology in many cases represents a limit in building scientific evidence (…) More tests/pilots need to be tried before they are developed at global public level.” (Prof. Fattore). What about the role of the Media? Media are not scientists. They rely on information provided by authoritative sources (i.e. EFSA, WHO), but it is not always easy. Sometimes there is no scientific consensus (i.e. the recent “red meat” case). “Science may not be unanimous, meaning that there may be more than one answer” (Emsden, Journalist). At the same time, “media are also private companies that need to sell, therefore they will look at controversial news” (Simon, journalist). Clearly, there is a problem. Decisions are not always based on science, or science does not always provide clear answers; in addition, communicating science is not straightforward and can have repercussions on consumers’ perception of reality. This is why more cooperation and engagement among all interested parties is needed. We need to seat together and build a new collaborative approach based on solid, common and agreed principles and ethics. More in particular, a common comprehensive agreed framework is needed to facilitate the interaction and relations between Science, Media and Decision Makers in order to develop sound and science-based nutrition policies. “Common platforms to share ideas and best practices are needed” (MEP Delahaye). The debate was open, frank and constructive. We will continue working on this important issue, looking for fresh ideas. Comments and cooperation from all interested stakeholders are, of course, always welcome.